iPHONE VS ANDROID! Actually, it doesn't matter which phone you carry. Our cool, new app turns both smartphones into field-tested satellite trackers. Learn more. COMET HARTLEY AND THE OWL: The comet show continues. After visiting the Pacman nebula on Oct 1st and 2nd, green Comet 103P/Hartley 2 is now paying a call on the Owl cluster. Readers with wide-field telescopes are encouraged to monitor the comet's busy track across Cassiopeia in the nights ahead--especially Oct. 7th and 8th when the comet glides a mere 1o from the photogenic Double Cluster. Details and a sky map are available from from Sky & Telescope. The washing-machine-sized spacecraft was launched by the US Air Force in April 2005 to demonstrate "autonomous rendezvous and proximity maneuvers." In other words, it would approach, investigate, and photograph other spacecraft in Earth orbit. The mission was controversial because it aimed to prove technologies that could potentially be used for anti-satellite weapons. For some 18 months in 2005 and 2006, amateur satellite watchers kept track of the XSS-11 as it visited at least two other orbiting objects: the body of the Minotaur rocket that launched it and a military DMSP weather satellite. "XSS-11 soon completed its mission, and in December 2006, it was manoeuvred into a disposal orbit, i.e. one with a sufficiently low perigee to reduce the time to decay from centuries to decades," recalls Molczan. "The dimensions and inclination of the new orbit were made public, but without complete orbital elements, it would have been difficult to find. 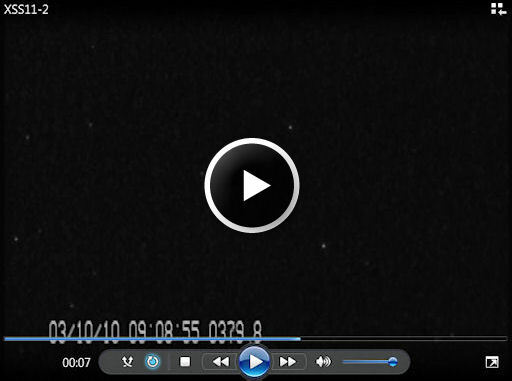 I expected that eventually, it would be spotted as an unknown object, which is what happened on 2010 Sep 20 UTC, when Kevin Fetter noticed something make a brief, bright flash on his monitor." "Except for the ISS toolbag, this is the smallest satellite I have ever recorded," says Fetter. "I might not have found it except for that flash. At maximum, it was about 4th magnitude, visible to the naked eye in a good dark sky." Presumably, some flat surface on the XSS-11 is glinting in sunlight, attracting a degree of attention that belies the satellite's modest dimensions. See for yourself. A schedule of XSS-11 flybys is available on your cell phone and on the web. "I was at my lake house in central Wisconsin during the area's first hard freeze," says Pritchard. "The air temperature plunged below 30F. With water temperatures in the lake still above 60F, I figured photogenic morning steam would be a sure thing. The steam devils started sprouting up around sunrise. Light winds blowing across the lake surface created little areas of vorticity, which were stretched by updrafts into tall and tight circulation patterns. Pretty mesmerizing stuff to watch as they really do resemble little water spouts." 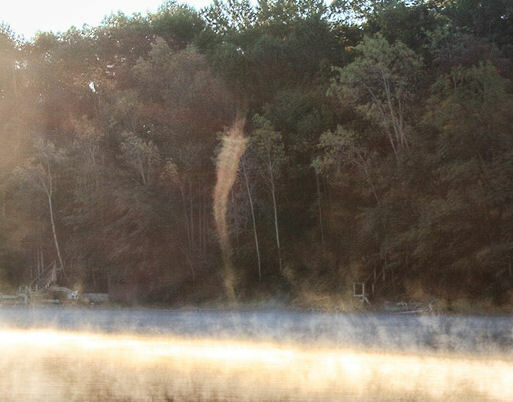 Pritchard's video of his experience will make you want to find a lake and wake up at dawn. On October 5, 2010 there were 1147 potentially hazardous asteroids.